A young mermaid, called Fish Girl, in a boardwalk aquarium has a chance encounter with an ordinary girl. 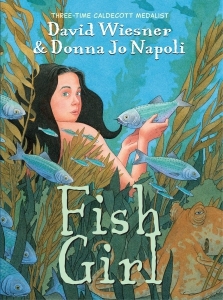 Their growing friendship inspires Fish Girl's longing for freedom, independence, and a life beyond the aquarium tank. Sparkling with humour and brilliantly visualised, Fish Girl's story will resonate with every young person facing the challenges and rewards of growing up.